I went out and splurged on LUSH again! It’s never a good thing for my wallet but makes me very happy! I didn’t anticipate to spend as much as I did, but I had a $10 gift card and stopped counting. I had originally just gone in to pick up some bath bombs for my up coming anniversary.We picked up some awesome bath bombs, melts and bubble bar! My fiancé seemed to enjoy the sweet scents more so we decided that for our anniversary we would have an awesome bath containing Twilight Bath Bomb, Creamy Candy Bubble Bar, and MMM Melting Marshmallow Moment. These sweet, delicious smelling items will probably leave us looking for candy afterwards! I also picked up another Honey Bee, and wanted to try Sakura. I’ve been looking at Vanilla Dee-lite for some time now… It is just expensive so I had a hard time bringing myself to purchase it. I’m glad I did! It smells so delicious and makes my hands feel so much better. The first couple times using it, I ended up having to share it with my fiancé because I took too much! LUSH products always amaze me with how very little you need! My fiancé isn’t the biggest LUSH fan, but due to my lack of trying! He is just very particular about smells he enjoys and isn’t over powering. One of the few product lines that he enjoys is Dirty. He has the body spray, the shaving cream… so this time he wanted to try the bar soap! The Dirty Soap has such a nice clean smell to it. I find it to be a very tame, but manly smell. Reminds me of things like Old Spice and Irish Springs. So he smells pretty fabulous. I also decided to try out the Brazened Honey face mask (missing from the photo below). I have already used it up at this time, (I usually make my haul posts as soon as it happens, but I had a lot to post at that time and didn’t want to overwhelm!) I’m not going to bother writing a separate journal for it’s review, I’ll include it below with some comments about the products mentioned that have been used. As promised, I have some small reviews for the products listed. Let’s go in alphabetical order, shall we? Brazened Honey – This face mask is very heavy. I find with the face masks I’ve tried in the past, I’ll usually get 3-4 masks out of them, This mask is so dense and hard to apply, that it I only had two uses out of it. I’m not a huge fan of the smell, I anticipated it to smell sweeter than it does, but it’s not a repulsive smell so it was okay! At the time of use, it would make my face feel very soft and made my skin feel a bit brighter. I ended up breaking out a bit a couple days after using it. This was a problem of the past, that I’ve not really seen a whole lot of since using Ocean Salt. When I use these face masks, I put the Ocean Salt off – as I don’t want to counter act the mask, or over cleanse my face and cause it to dry out. This is probably not a mask I would buy again, but I wouldn’t say never. I read a lot on LUSH products usually, so if I come across tips and tricks, I’m usually willing to give something a second chance. Dirty Body Spray – My fiancé uses this body spray every day! If used correctly, it’s a light fragrance on his body that I may get a small smell of in passing, but is usually enjoyed when hugging/cuddling and my face is against his chest. When we were first purchasing it, he was trying it in the store, and I had offered my wrist as a place for him to apply it to. (He had a large sweater and coat on and couldn’t access skin.) Well, he didn’t realize that it wasn’t a dainty body mist type of spray – it’s a full on spray (much like a Windex bottle) and dosed my whole hand and wrist in it – with it leave my hand & wrist wet. We had a good laugh over it – and it was so strong that even after washing my hands a few times – it’s all I could smell! Great product overall, just be careful not to be trigger happy. Dirty Shaving Cream – I have not used this product myself as I don’t use shaving creams or gels, however, my fiancé has and enjoys this cream. He said it was awkward to use at first, as it’s not like most shaving creams – it feels more like a moisturizer. It has a very light smell, and seems to leave his face with moisture after shaving, unlike when he uses other creams or gels. Dirty Soap – This soap is great, just like the rest of the line! It lathers up, has that clean fragrance and leaves him feeling soft and smooth! Ocean Salt – Love, love, love!!! This is probably one of the products I will continue to use over the years. This product is great on my skin. It leaves it feeling tingly clean, fresh, and healthy. Not to mention, I enjoy the smell of it! I love that the top of the pot is usually always this nice dark blue, and it’s a lighter greenish-blue throughout the rest of the pot. This would be difficult on more sensitive skin, as it does utilize coarse salt. Vanilla Dee-lite – This is a very thick moisturizer. It’s fantastic – and I wouldn’t change it at all. The packaging is all I might change – I find it hard to get only a little bit out of the container. I have to really give the bottle a good squeeze to get anything out of it. I believe it would be better suited in a pot. Has a great smell, leaves a light fragrance on the area it was used on and I usually only have to use it once every few days. 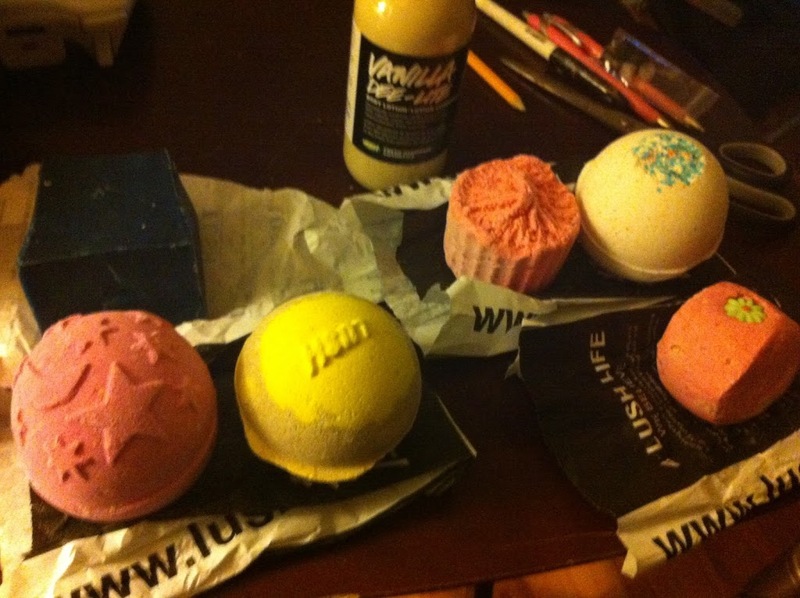 I hope you enjoyed this LUSH haul and the reviews at the end. So many great products that are worth the cost. If you have any questions – don’t hesitate to ask!